Pioneers in the industry, we offer printed parchment paper and butter paper from India. 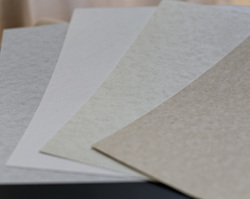 We are offering Printed Parchment / greece proof Paper to our clients.this is oil absorbent paper . Packaging Details: These non-stick baking paper can be used for lining cookie tray, cake pans, baking pans, and for reheating pizza, or baking fish in the oven. It eliminates the need of greasing and oiling the pan before baking. It is non-stick, grease locking, and moisture balancing. It is made from eco-friendly and non-toxic material. Size (l x b in Inches if custom size needed) 20*30"
We are offering Butter Paper to our clients.